LAST SUMMER, WHEN a labor standoff imperiled the N.B.A. season, J. R. Smith was one of several American players who opted for a sure paycheck by signing to play in China. In his first and likely only season in the Chinese Basketball Association, Smith became an immediate sensation, leading the league in scoring, and bringing international attention to his team, the Zhejiang Golden Bulls, which plays its home games in Yiwu, a manufacturing city known, thanks to its principal export, as “sock town.” Though he piled up impressive statistics, Smith’s run in China ended with mixed results. All season he remained aloof from his teammates, separated by an unfamiliar language, and he ran afoul of management, who claimed that he had been faking injuries. Smith was named a league All-Star, but the Golden Bulls missed the playoffs, bringing Smith’s year abroad to an early end. He is back in the States now, having recently joined the New York Knicks for the remainder of the American season. In China, his former employer is withholding a third of his salary, claiming that Smith skipped too many practices. J. R. Smith is not the only basketball mercenary to have done a tour in China, nor is his uneven experience a particularly unique one. A glance at the statistical leaders from the past season reveals a list of names, mostly American former collegians or benchwarmer pros, which might be faintly familiar to the casual fan. International players dominate the C.B.A., and landing a talented star can immediately improve the prospects of a middling team. Yet as Jim Yardley writes in Brave Dragons, a narrative of the year he spent with a team from the coal-belt city of Taiyuan, the league is wary of its foreign imports, limiting roster spots for internationals to two per team. 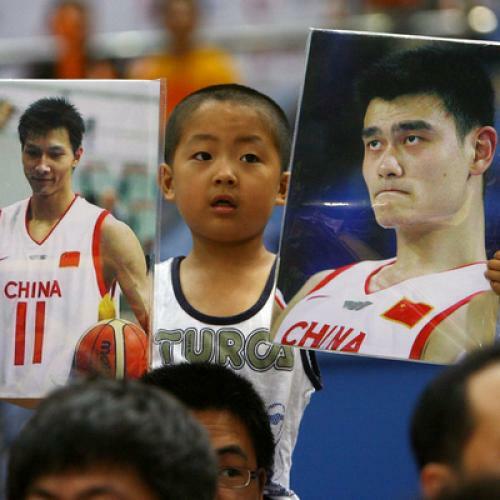 Basketball is China’s most popular sport, a fact that creates, in itself, a kind of existential national crisis, since a more perfect version of the game is played elsewhere, in the United States. Chinese players, Yardley writes, “had been taught to regard themselves as defective,” and “considered themselves genetically less capable of excelling at sports that require a combination of power and speed.” Foreign hired guns raised the level of play in China, but they were also a constant reminder of domestic inferiority. Could there be another way to improve the Chinese game? It quickly becomes apparent that Weiss is, if not exactly in the wrong place, then certainly in a strange one. At the team’s first press conference, Boss Wang proudly introduces his new hire, before offering a bluntly uninspiring prediction: the Brave Dragons will finish tenth. Weiss is originally hired as a consultant, but is then suddenly promoted to head coach, before being demoted and then re-promoted at points during the season. It never becomes clear what his precise role is, other than being made subject, along with his players and staff, to the whims of the idiosyncratic owner. At times he shares power with a Chinese coach, Liu Tie, who is retained for his ability to impose discipline on the team. Boss Wang explains his organizational model to Yardley, saying that Weiss “is accustomed to dealing with lots of high-level principles. Our players are very young, very raw.” Weiss is occasionally incredulous, but mostly remains an affable and open-minded protagonist in a narrative that works, on one level, as a familiar fish-out-of-water story. Weiss isn’t the only fish gasping for air. At point guard is Little Sun, an earnest Taiwanese player who becomes the object of disdain for his Chinese coach, who chides him for playing “Taiwan independence defense.” There is the Nigerian big man Olumide Oyedeji, who had done a stint in the N.B.A. and now is in China, as he explains, “looking for money and trying to explore different ideas and different mentalities.” Oyedeji is joined by another giant, Ruslan Rafaelovich Gilyazutdinov, a broken down and out-of-shape Kazakh whose brief tenure is defined by his favorite expression of dismay: “It was boooooolsheeet.” Into this scene at midseason arrives Bonzi Wells, a talented American with a long history of conflict with coaches and teammates, who at the time, was perhaps the biggest basketball star ever to play in China. In the sentimental Hollywood version, this ragtag group of has-beens, never-was, and eager rookies gunning for a shot at fame might have coalesced for a championship run. Yet for the Brave Dragons, the big time is somewhere else, and even tenth place seems unlikely. An American coach is like a seed of a very good American plant, an American species. But if he wants it to grow a flower in the soil of China, it is very tough. Other seeds from other countries have a hard time growing here. Chinese basketball is a more physical game than its American counterpart—fouls followed by fights are not uncommon. Last year, a massive and quite terrifying brawl broke out between the Bayi Rockets, a C.B.A. squad, and the Georgetown University men’s team, which was visiting China in what was touted as a “goodwill tour.” Video quickly went viral online. Watching it, you notice a marked desperation on the faces of the Chinese players as they punch and kick and chase their American opponents around the court. Later, as Georgetown leaves for the locker room, fans begin throwing plastic bottles from the stands. The season that Yardley followed the Brave Dragons was also peppered with startling moments of rage. Boss Wang holds hour-long shouting symposiums following games, which the foreign players often tune out by wearing headphones. At one point, in a moment of blind anger, he even hits one of his players during a game. Fans, meanwhile, are convinced that the contests are corrupted by bought officials, in a system known as “Black Whistle.” At a pivotal moment in the Brave Dragons’s season, the home crowd throws “plastic water bottles, lighters, crumpled paper cups, even cell phones” onto the court to register its disgust. Perhaps what is missing, for everyone, is the essential ingredient of fun. Ian Crouch is a contributing writer about sports and culture at newyorker.com.